At this time of the year fruit and vegetables are quite expensive in Germany and, even worse, of fairly bad quality. Ever got tomatoes in February? Don't do it. One of my favourite vegetable in late winter is broccoli. And one of my favourite dishes with it is this broccoli tarte. Once I had to feed a crowd in February and, being equally tight on time and on budget, I came up with this recipe. Since then it has become a somewhat standard dish which I have to do often. I always make a full baking sheet. The tarte is still perfect the next day despite the quark-oil-dough, which in general is best fresh. It can also be eaten cold (at room temperature! ), and my nephews like to take along a few pieces for lunch the next day. The crust is quark-oil-dough, which is very quick and easy to make. Not as fatty as shortcrust pastry and not as time consuming as pizza dough. The detailed recipe you'll find here. In a large frying pan heat butter and oil and cook the onions until they are soft and have a light golden brown colour. Don't let them get dark. This is best done over a low heat. When finished add the crushed garlic. The onions are substantial in this recipe, the more the better. Set aside to cool down. While cooking the onions prepare the broccoli. Cut off tough ends, wilted leaves and any yellow parts. Cut off the thick stems, peel and slice them. Cut the heads into smaller flowerets. 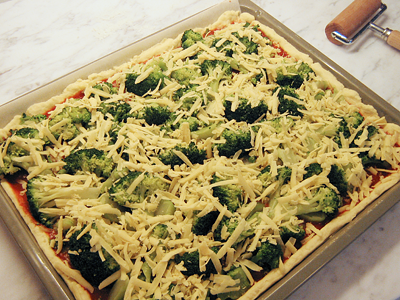 For the tart the broccoli pieces should be smaller than you would like them if serving as a side dish. Soak and rinse prepared broccoli in cold water. In a large sauce pan bring salted water to the boil, add sliced broccoli stems first and cook for around 2-3 minutes. Then add the flowerets and cook another 4 minutes until tender but not too soft. Drain and set aside for cooling down. Preheat oven to 180°C (= 356°F). Grate the cheese. Make the dough, roll it out with a baking pin. Line a deep baking sheet with baking parchment or grease and dust it. Line it with the dough now, forming a rim. Prick the bottom with a fork. Pour the tomato puree on top of the dough and spread. Put the onions on top, spreading them evenly too. Add the broccoli. Sprinkle each layer with salt and pepper. Finish with the grated cheese. Bake in the oven for around 40 minutes. Take care for the cheese not getting brown. Serve with a green salad. Especially good on broccoli is a mild blue cheese, btw.